ADEN/DUBAI (Reuters) - Saudi Arabia and its adversaries in Yemen's armed Houthi movement are holding secret talks to try to end a three-year-old war that has unleashed the world's worst humanitarian crisis, diplomats and Yemeni political sources said. Speaking to Reuters on condition of anonymity, two diplomats and two Yemeni officials said the Houthi spokesman Mohammed Abdul-Salam had been in direct communication with Saudi officials in Oman on a comprehensive solution to the conflict. "There are consultations between the Houthis and the Saudis, without a representative of the internationally recognised government, and it is clear that there is a desire of the Houthis and the coalition to go towards a comprehensive agreement," one diplomat told Reuters. A coalition official denied that Saudi Arabia had any negotiations with the Houthis, and reaffirmed support, in a statement to Reuters, for U.N. peace efforts aimed at reaching a political solution. Houthi officials did not provide an official comment. The internationally-recognised Yemeni government of President Abd-Rabbu Mansour Hadi vehemently denied the talks in a statement posted on state news agency SABA, calling the report of them "lies" and "misleading news". Hailing from Yemen's Zaydi Shi'ite sect, the Houthis seized the capital, Sanaa, in late 2014 and drove Hadi's government into Saudi exile several month later. Fearing the advance was part of a regional power grab by Tehran, Riyadh and other mostly Sunni Muslim Gulf Arab states armed and supported by the United States and Britain intervened to restore his rule. The hoped-for accord would begin with a truce to pause fighting on nationwide battlefronts and culminate in the signing of a peace deal addressing the political interests of the warring parties, the sources added. Thousands of Saudi-led air strikes have killed hundreds of Yemeni civilians, while Houthi-led cross-border rocket attacks on Saudi Arabia have led to hundreds of casualties. 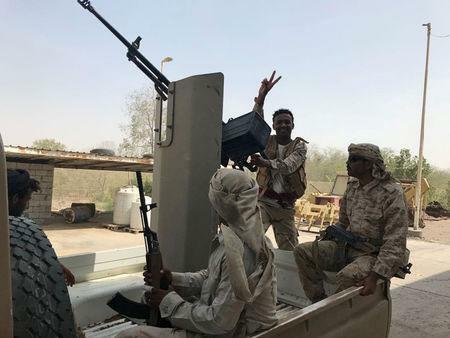 Coalition forces have made modest territorial gains but appear far from seizing back the capital from seasoned Houthi fighters. With no victory in sight, and as the war pushes the country towards famine, Saudi officials including the powerful crown prince and Defence Minister Mohammed bin Salman have expressed a desire to wrap up the conflict. Diplomats said the Saudi-Houthi dialogue had been going on for about two months and appeared aimed at providing a framework for a resolution to coincide with the arrival of a new U.N. envoy to Yemen, former British diplomat Martin Griffiths, who began his term on Sunday. But it was not immediately clear how much progress had been achieved. U.N.-backed peace talks between the Houthis and the Yemeni government were last held in Kuwait in August 2016. That round of dialogue and two previous ones in Switzerland, where there was no Saudi presence, ended without success. The current talks appear to have bypassed Yemen's Riyadh-based government, whose restoration was the justification for the Saudi-led intervention, underlining a series of deepening Yemeni squabbles which have hobbled the coalition war effort. Two Hadi government officials contacted by Reuters were unaware of the dialogue, and their criticism of the coalition has mounted in recent days, accusing them of barring Hadi and other Riyadh-based officials from returning to the country. Hadi has mostly resided in Riyadh, while government-held areas in Yemen experienced a series of deadly attacks by Islamic State militants. He last visited in February 2017.